TigerWit Limited, the UK-headquartered global financial technology company, today announces significant Year-on-Year growth figures with some of the firm's key performance indicators increasing considerably. In 2018, client opening trade numbers rose by 68% when compared to 2017 and as at Year End clients' balances were up 38%, demonstrating a substantial uplift in client activity across the group. This growth led to an overall increase in TigerWit's total revenue in 2018 to $19.6m versus $10.0m in 2017, a rise of 96%. Tim Hughes, CEO at TigerWit, said: "2018 was a fantastic year for TigerWit and our global operations. Not only did we make a strategic acquisition and attract investment from the international technology group SIG, but we have seen revenues almost double for the year on the back of strong client acquisition and deposits. This is particularly pleasing to see given the regulatory backdrop and political uncertainty around Brexit. TigerWit is positioning itself as a global leader in the provision of online and mobile trading innovation." Another highlight from 2018 was TigerWit's sponsorship of Liverpool Football Club becoming their Official Online Foreign Exchange Trading Partner. This has provided TigerWit with exposure to match their multi-national presence. In 2019, TigerWit plans to secure more licences, sign more partnerships and expand further in other jurisdictions around the world. Mr Hughes continued, "Partnering with a Premier League football club and one with such a heritage as Liverpool FC is proving a successful part of our strategy to build TigerWit's brand awareness. We are looking ahead to 2019 with great optimism too. Our plan this year is to grow our global footprint even further and we look forward to providing further updates throughout the year." 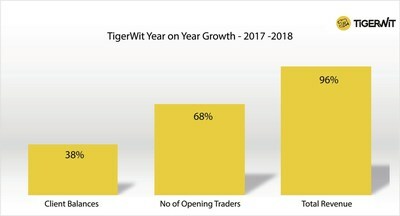 TigerWit is a UK headquartered global financial technology company, committed to changing the industry through disruption for the good of traders, by bringing innovative trading applications, such as blockchain-based settlement in the form of TigerWit's distributed trading ledger, providing access to key global markets and trade FX, indices, commodities and metals.